In between my machine travel to the repair shop, I was able to finish My Confetti Quilt. Let see how many first I have with this quilt. Overall it was a nice and enjoyable quilt to make. I started doing an spiral in this quilt but didn't like the overall effect and picked it out. I love this! And your quilting is a perfect complement to the piecing. Nice job! Very nice, just enough color to make it stand out. I joined your site, please come visit mine. 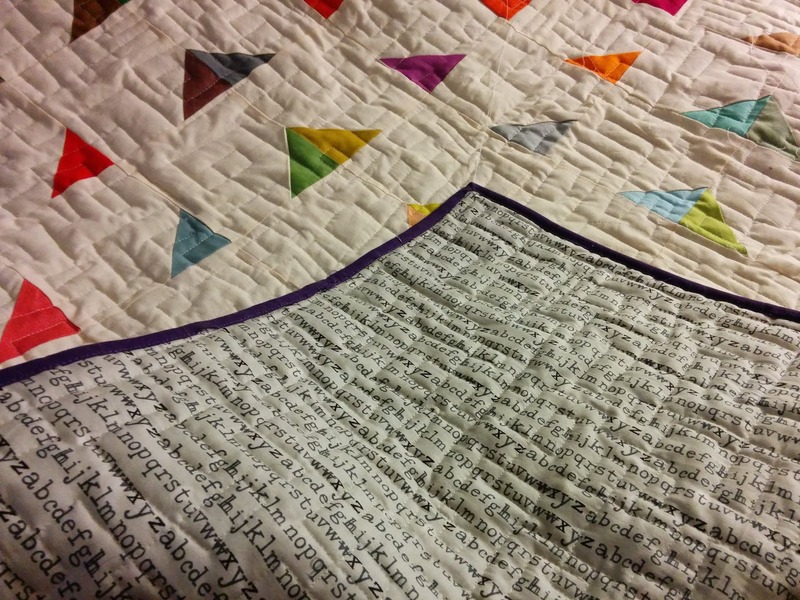 Congrats on so many firsts in this one quilt! It turned out beautiful and the quilting was a good choice too! Thank you....I love what you do!!! This is really beautiful quilt! Nice use of colour and your quilting is very effective. Thank you for participating to my Fabric, Thread and Yarn link party. Have a good weekend! I'm in the process of spiral quilting my first machine quilted quilt by myself - I hope I don't decide I want to tear it out, but I'm on the fence. I love the pattern that you decided on and the backing. Very nice project! A win all round. 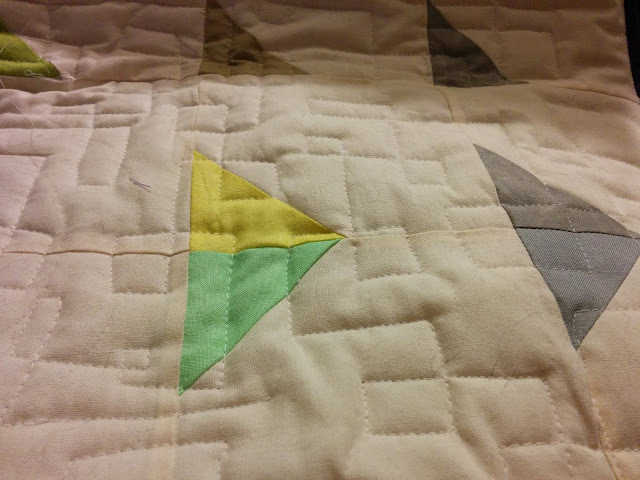 The triangles look great with the background fabric and the quilting really sets it off well. Great job. I love simple quilt designs like this that allow the fabrics and quilting to shine. It is a beautiful quilt,and so joyful! Great finish, love the quilting! Your quilt is a real winner. I love the solid colours and the simplicity of the design, and you have chosen an ideal free motion quilting pattern to go with the triangles. 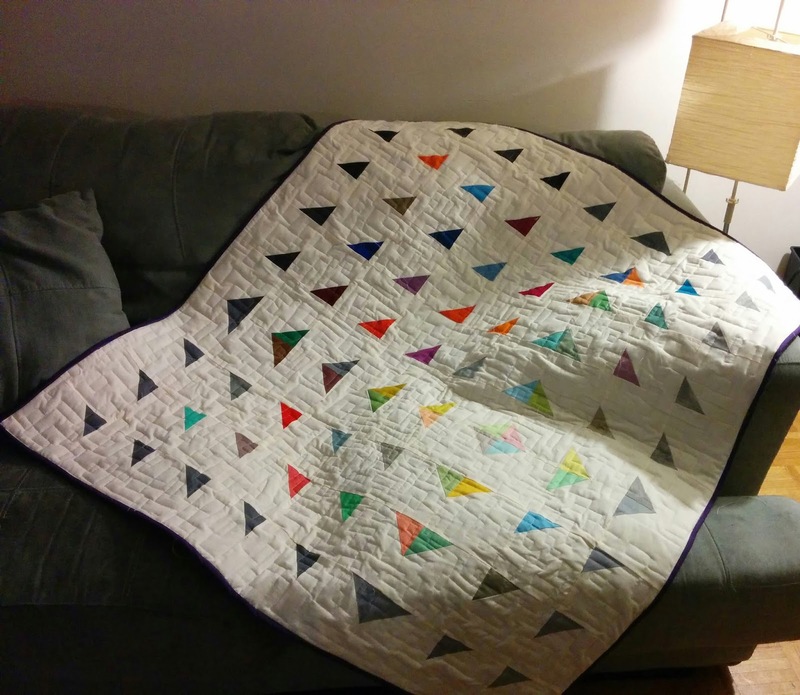 Thank you for linking up with Free Motion Mavericks - your quilt is this week's featured project! Great quilt! I just learned this quilting motif.